XO, OX – NEW Book and Art Exhibition! Oh, boy, do I have an announcement for all of you! It’s a NEW BOOK! 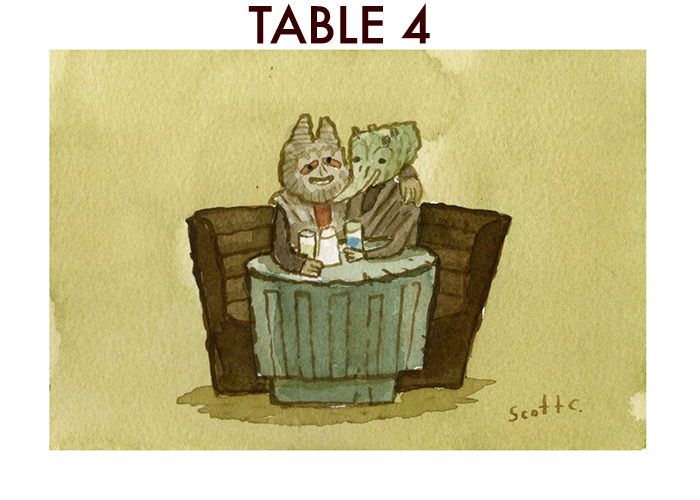 Adam Rex and I have teamed up to bring you a story of love and letters! Oxen and Gazelles! Suspenders and fancy dresses!! It is called XO,OX – A Love Story and it is out in stores right now! Brought to you by Neal Porter Books at Roaring Brook Press! Go down to your local bookstores and pick it up in your hands! Remember when we used to write letters telling one another how much we loved or felt annoyed with each other? This story really taps into that excitement. You will probably love it. Adam and I will be celebrating the release with a solo exhibition of the book’s artwork at Gallery Nucleus on Saturday Jan 14th! Jon Klassen will be celebrating the release of his new book We Found A Hat with an exhibition on the same evening at Gallery Nucleus! Come hang out with us! Los Angeles, CA — Artist Scott C and author Adam Rex will both be in the gallery in celebration of their latest children’s book, XO,OX A Love Story! Live reading by Adam Rex! And if you live in New York, I will be celebrating at Books of Wonder in the beginning of Feburary! Adam will unfortunately not be in attendance at this one, but perhaps we can have a little picture of him there for you to chat with. And now would you like to see some spreads from the book? 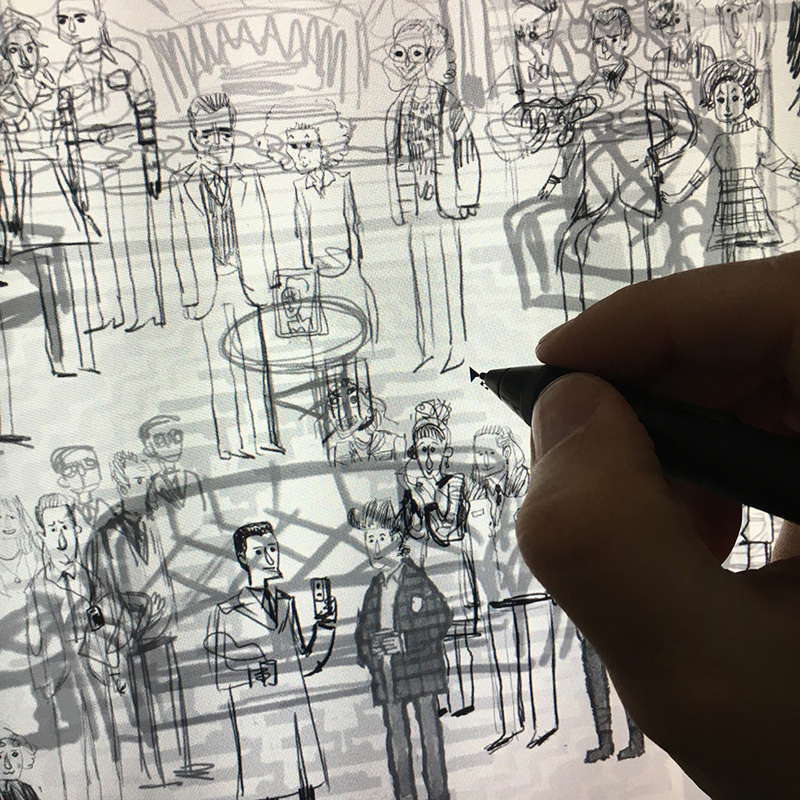 How about some rough workups for the book? It is time for the Scott C. Holiday Gift Guide! How’s your year been? Yeah, i know, me, too. But let’s get in the HOLIDAY SPIRIT! Gift ideas can be real tough to come up with especially with our busy schedules. Well, honestly, don’t worry about it because I have all kinds of Scott C. themed ideas just for you and your loved ones. Everything can be found in The Scott C Shop and on top of that everything is 15% off in the Scott C Shop now until Dec 4th! Just use the code: Holiday15. And how about some FREE Shipping on Domestic Orders at are $50 or more?? Let’s do it. Our big news for this holiday season are NEW PINS! We are adding three more for the holidays: the WheelDog, the Triple Horner, and the Little Giz! These are so new that they are still in production and will not ship until Dec 9th. We are also doing a special 4 PIN PARTY PACK in which you can get any 4 pins for $35! It’s a wonderful way to make you jacket look incredibly festive. There are things in the forest! Have you seen them? I’ll bet you are a huge fan if you have. I for one am a huge fan of these things that are often in the forest. They are also in a nostalgic little suburban town roaming around riding bikes and freaking out on telephones. 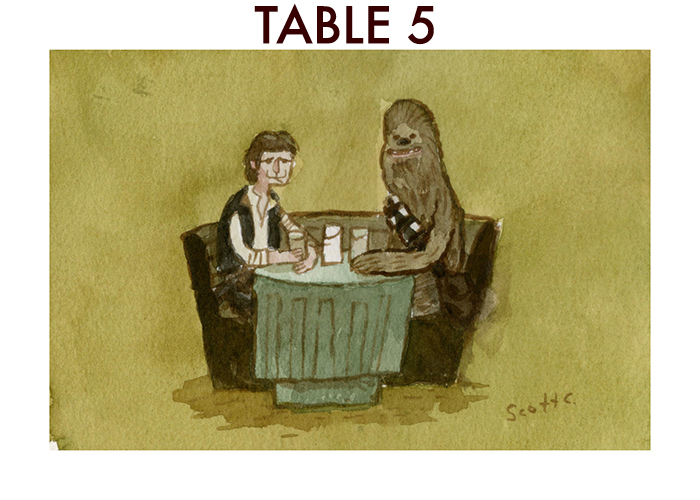 This print will look wonderful over your loved one’s couch or vintage record player or 8-track player. Do your loved ones like VESTS? Let’s take a moment to revel in the presence of VESTS. These are the most famous of all VESTS! Some you may recognize and some you may not. It’s ok if you don’t recognize all of them, just ask a friend’s help with it. But regardless, these wonderful VESTS should most definitely live on your loved one’s wall perhaps near or inside of the closet itself. The foyer might also be a good spot for it, near the hanging coats. The great battle of the day has ended! Time to party! 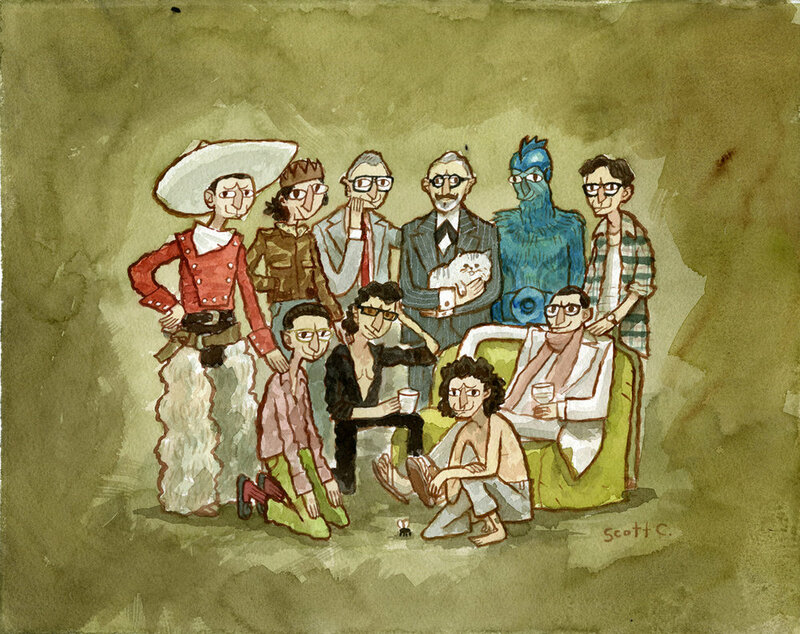 Just float on up and reconvene with old friends and new ones in this print of the after times. Leave those old bones behind! You don’t need them at this party! 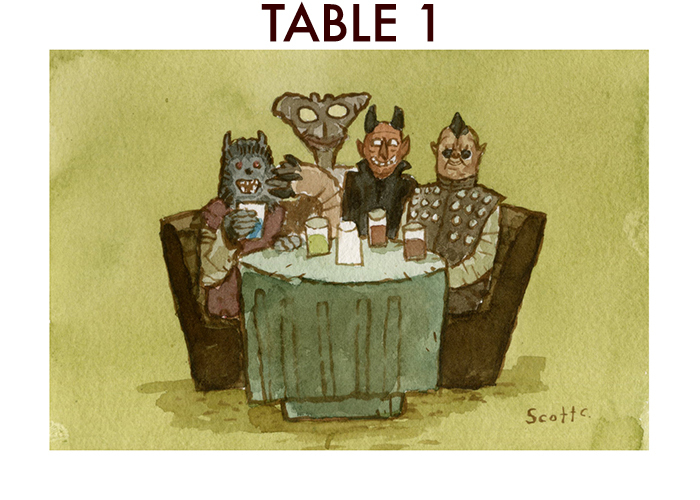 I’ll bet this print would look nice hanging over your loved one’s D&D sword collection. All kinds of little pins to adorn your loved ones pajamas, jackets, or backpacks! They will love walking around with these shiny little guys all over themselves. So many wonderful fellas in one place! They’ve been through so much! I’ll bet your loved one has a big crush on this guy. I know I do. What a wonderful time everyone is having in the afterlife! Some fun and games and a little work to be done here and there. Your loved ones may enjoy spending some time with the loved ones already enjoying the afterlife! This is a piece from my Wonderful Days solo exhibition at Guru Galeria in Mexico City! Here is a shirt with some skulls on it. I am sure you love skulls, but do you also like plants? Because these little skulls have some plants growing out of them. Your loved ones like skulls and plants as well. They need a new shirt this holiday season and they don’t come more festive than this one. 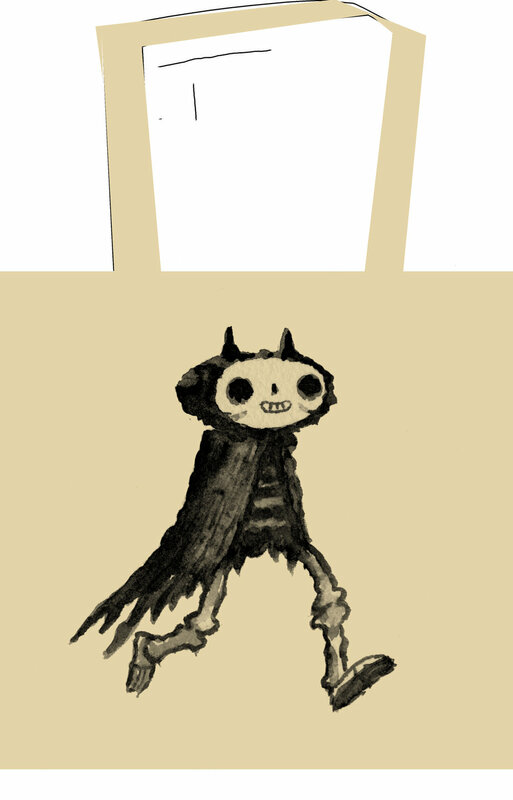 Who’s this little Skeleton Devil cruisin’ through?? Where is he going? Probably on the way to the local shop to pick up some books! Wouldn’t it be great if you were also cruising along with this Skeleton Devil? Now you can! He’s on this bag! You can carry him with you! And your loved ones will enjoy getting gifts in this thing i’ll bet. Mortimer and Mildred are back with the sequel book calledZombie in Love 2 +1! It follows the young couple as they journey into parenthood! A brand new human baby is left on their doorstep and they must learn to care for him. They discover quickly that human babies are not into zombie stuff. Parenthood can be a struggle normally, so you can imagine how tough it is for these two zombie parents to care for a human baby. I mean, just imagine! And guess what? All your other friends are in this book, the zombie dog, the worms, even a new zombie cat. You’ll probably love it. Here is a classic pick! HUG MACHINE is the story of a child who is super down with hugging. He is the self-proclaimed Hug Machine and he is very excited to tell everyone about it. He is very good at hugging and he is not shy to show the world. He is ready for you to watch how amazing he is at hugging. He hugs people, but he also hugs things. Nothing escapes. Nothing. He even solves problems with his hugs. Sometimes he comes up against some real tough hugs. Hugs that would make others give right the heck up and turn away. But the Hug Machine never backs down. And if you, the reader, need a hug? The Hug Machine will hug you. Do not worry! Everyone gets a hug. And thus concludes this SCOTT C. HOLIDAY GIFT GUIDE. I hope you all have some wonderfully warm holiday times. You are great. NEW Items in the Scott C Shop! 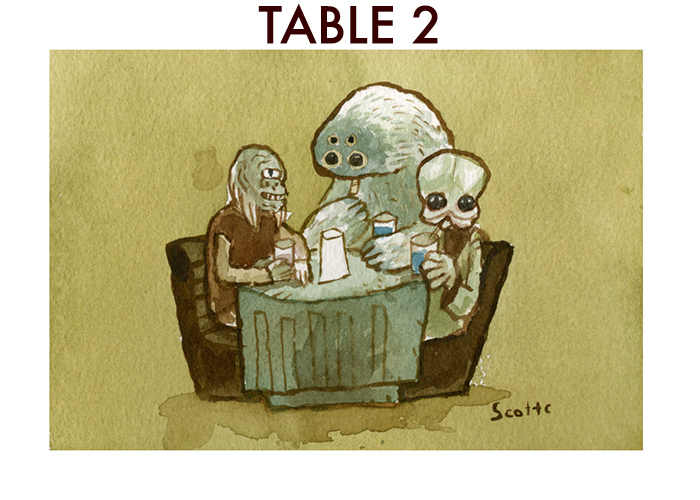 All of the San Diego Comic Con releases are now in the Scott C Shop, except for the Cantina Table Series (goes up Wednesday at 3pm EST), Great Showdown: Disagreement Among Friends (goes up on Thursday 3pm EST). The 100 Acre Log Run and Hug Machine pins can only be found in the Gallery Nucleus shop right now! 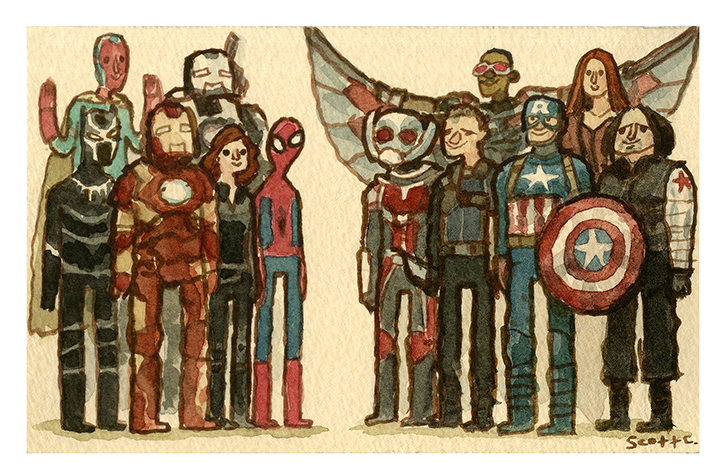 *** SHIPPING NOTES: Great Showdowns prints may not ship until after August 29th. Shipping will be closed Aug 19-29. San Diego Comic Con! NEW ITEMS FOR SUMMERTIME! It’s San Diego Comic Con time! I will be at booth #2643 with Gallery Nucleus, as usual! Here are all of the new things that i will be debuting at Comic Con this year. 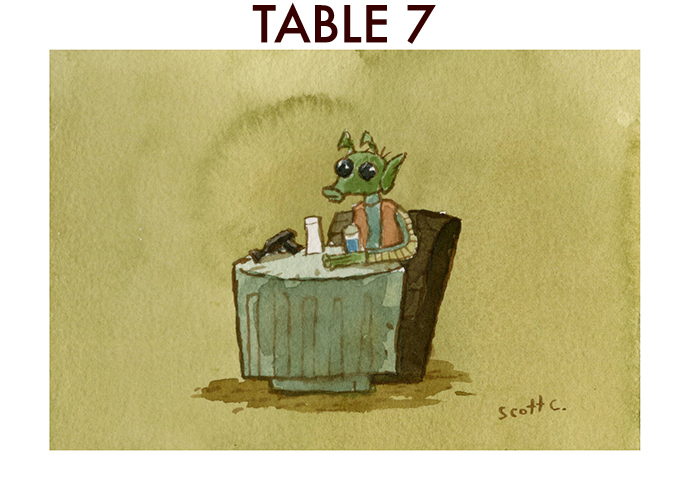 (note: a NEW Cantina table will be released each day of the show, two released on Saturday and Sunday see schedule below!) Most of these items shall become available soon after Comic Con in my online store at shop.pyramidcar.com! 14. Any prints that I still have from past runs! Most of these items shall become available soon after Comic Con in my online store at shop.pyramidcar.com! Scott C Holiday Gift Guide!! + Pacific Rim print! It is time for the Scott C Holiday Gift Guide! I know you could use some help with your holiday gift buying, so allow me to lend a hand. This is the perfect time for you to have a Scott C Shopping spree because everything is 10% off in the Scott C Shop now until Dec 4th! Just use the code: Holiday10. It’s not everyday that one enjoys a ride on some Jurassic Backs, but these lucky dinosaur park goers have found themselves in that very lucky position. 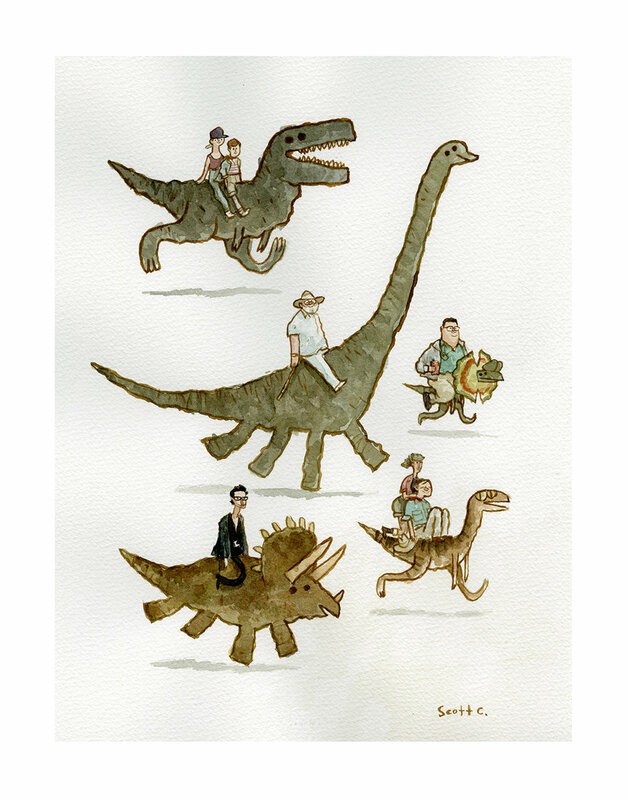 For anyone who enjoys dinosaurs or rides! Here he comes! All wigglin’ and green! 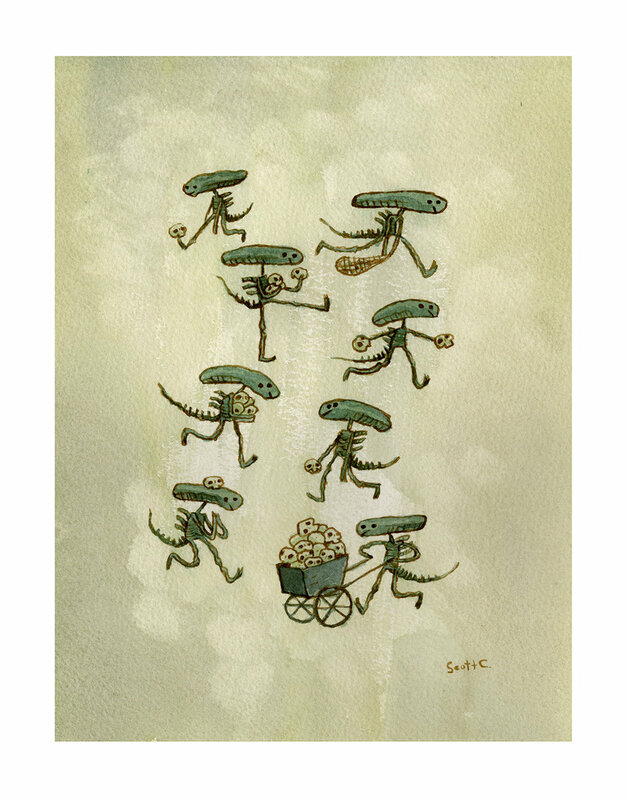 If you enjoy wiggling or things that are green, you will probably love this print! Aliens going about their business with skulls in tow. For anyone who enjoys skulls, towing, or aliens! What a wonderful feeling it is to be carried along by you Goblin henchman, dreaming your big dreams. This print for for anyone who enjoys being carried by goblins! When you are at your desk all day and all night, why not put engines on it and take to the skies? This print can inspire you to do so! Just put it on your wall and imagine enjoying this adventure! Here is a classic pick from last year! HUG MACHINE is the story of a child who is super down with hugging. He is the self-proclaimed Hug Machine and he is very excited to tell everyone about it. He is very good at hugging and he is not shy to show the world. He is ready for you to watch how amazing he is at hugging. He hugs people, but he also hugs things. Nothing escapes. Nothing. He even solves problems with his hugs. Sometimes he comes up against some real tough hugs. Hugs that would make others give right the heck up and turn away. But the Hug Machine never backs down. And if you, the reader, need a hug? The Hug Machine will hug you. Do not worry! Everyone gets a hug. Do you enjoy knights, warriors, princesses, kings, swords, and frozen monsters? 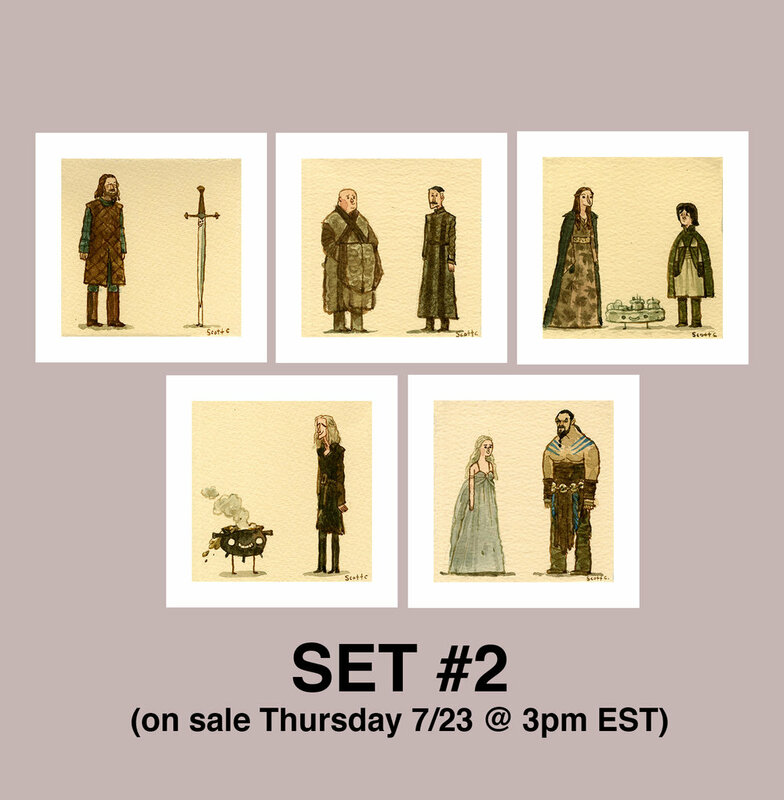 Then these are probably the print sets for you. This print is not in the Scott C Shop, it is in the GALLERY 1988 SHOP! This is a special timed release of the classic “Boats For Everyone” painting from Gallery 1988! On sale until December 3rd for $70! Great for anyone who enjoys boats, towns, and monsters! Expected delivery by mid-January! So it will arrive after the holidays! 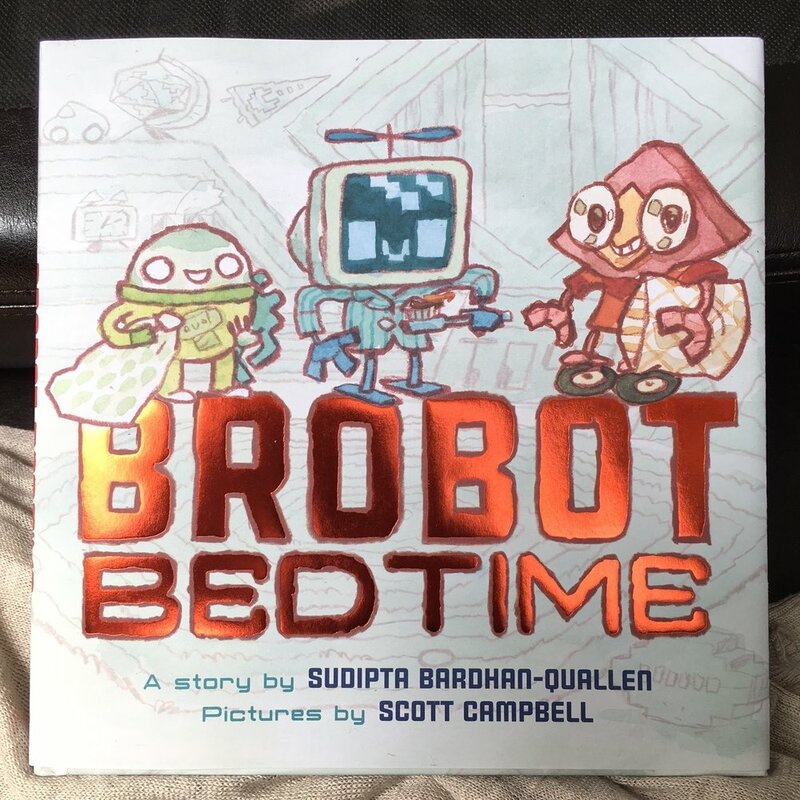 Ok, thus concludes the Scott C Holiday Gift Guide! I hope you enjoy your holiday season and are not too stressed out about shopping. Because really you should be enjoying some Holiday cheer. See you!